It is very popular to raise Monarch butterflies indoors mostly because the caterpillar and the butterfly are beautiful, the chrysalis is stunning, and monarch butterflies are gorgeous and widespread. The process of watching a caterpillar become a butterfly is truly awesome and it really is easy to do! Monarchs have a large range and can be found all through North America, Mexico, and into Canada as well as other parts of the world. Their host plant (the plant their caterpillars eat) is milkweed (Asclepias). There are many different varieties of milkweed that the Monarch caterpillars eat which adds to the ease of raising monarch butterflies. 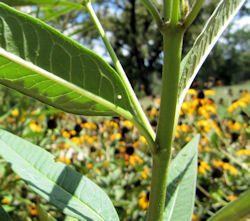 Please visit our article about Milkweed Plants for Monarchs for more information. Milkweed also serves as a nectar source for Monarchs and many other butterfly species. 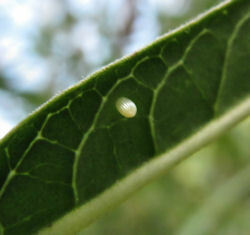 Monarch butterflies generally lay their eggs singularly on the underside of the leaf. The easiest way to find eggs is to watch a patch of milkweed plants for a visiting Monarch butterfly. When you see one hanging around for a day or two you will probably be able to find the eggs relatively easily. Look at the underside of the leaves. You can also find eggs on the flower buds. Once you find the eggs/caterpillars you will want to bring them in soon to their indoor caterpillar home. If you leave them out they may start disappearing due to natural predators. If you think you might not have enough food for all of them and you don’t have a supply at a nearby nursery (or friend’s garden) you may want to leave some outdoors and let nature take its course. In about 2 weeks from the time the caterpillar hatches from the egg the Monarch caterpillar will be ready to pupate. Monarch caterpillars will be about 2 inches long when they are ready to form their chrysalis. It is safe for humans to hold and touch the Monarch caterpillar but it is not always safe for the caterpillar. When they are young/small they are quite delicate but as they grow it becomes safer for them to be handled. The one time that no caterpillar should be handled is when they are preparing to molt. They will molt several times as they grow. Prior to their molt they will stop eating, lay down some silk (which you may or may not be able to see), and stay still for around 24 hours then split their old skin and wriggle out. During this time, and for several hours afterward, they should not be moved or touched. When the Monarch caterpillar gets ready to pupate it will spin silk, attach itself and hang head-down in a “J” shape. The caterpillar will stay like this for around 24 hours. Shortly before its final molt the caterpillar will straighten some and the antennae will become ragged rather than the normally rigid appearance. Within an hour or so the caterpillar will shed its exoskeleton and expose the pupa. 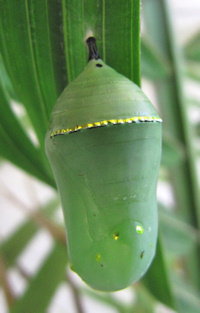 Over the next several hours the Monarch pupa will continue to change into the beautiful jade, with gold trim, chrysalis that the Monarch is so well known for. It is truly a work of art. The Monarch chrysalis will stay like this for about 1-2 weeks. About 24 hours before the Monarch butterfly is ready to emerge, the chrysalis will begin to darken and become transparent so that right before the butterfly emerges you will be able to see the wings inside the chrysalis. Very cool! Monarch butterflies usually eclose sometime in the morning hours so be sure to check it first thing in the morning when the time gets close. When the Monarch butterfly emerges it will have crumpled wings and will need to pump them full of fluids and dry them. During this time it must be able to hang its wings freely with nothing touching them so that they are not hindered in their full formation. 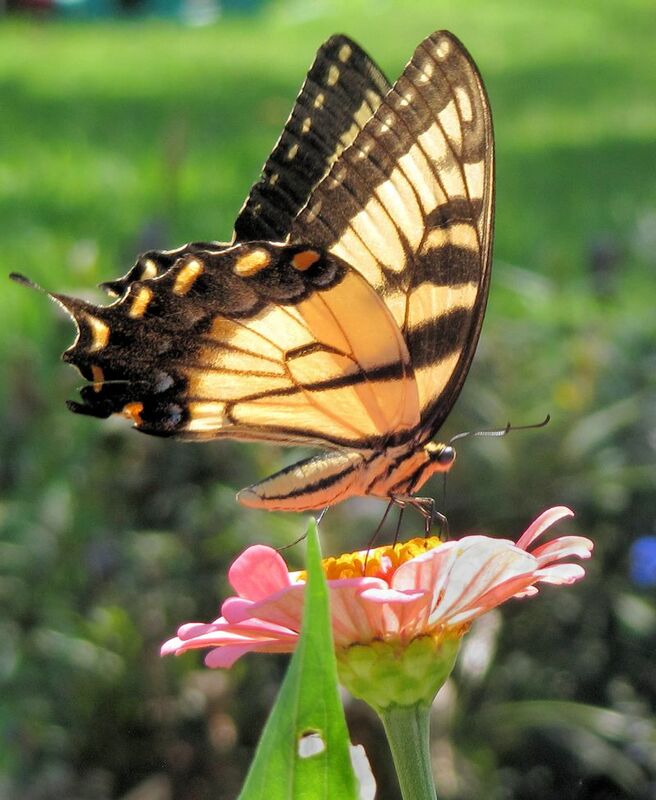 It will take the butterfly several hours to prepare for its first flight but when it gets close to being ready it will start to flutter its wings some. 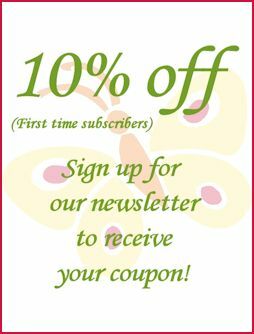 If you want to allow your butterfly to crawl up on your fingers this is a great time to do it. Monarchs are beautiful in all of their life cycle stages which makes them such a spectacular butterfly to raise indoors. Each Spring, my kids and I have Milkweed seeds sprouting up in flats for planting in the garden so we can attract and feed the Monarch caterpillars. We always get excited about the return of the Monarch butterflies. It is great fun! This entry was posted in Butterflies and tagged monarch, monarch indoors.